Our Commonwealth's current prosperity depends, in no small part, on the investments that earlier generations made before us. Think of where we'd be if earlier generations hadn't invested in our subway system or the Massachusetts Turnpike - or if the Commonwealth hadn't committed to establishing the nation's first public school. Our state and our lives would look quite different today without those forward-thinking investments. Some of the most important things we do together through state and local government is educate our children, increase the mobility of our people through public transit and safe roads and bridges, and improve people's well-being through access to healthy foods, medical care, and other necessities. And, improving the quality of the education our children receive and the transportation infrastructure our communities rely on requires up-front investments for long-term pay-offs. 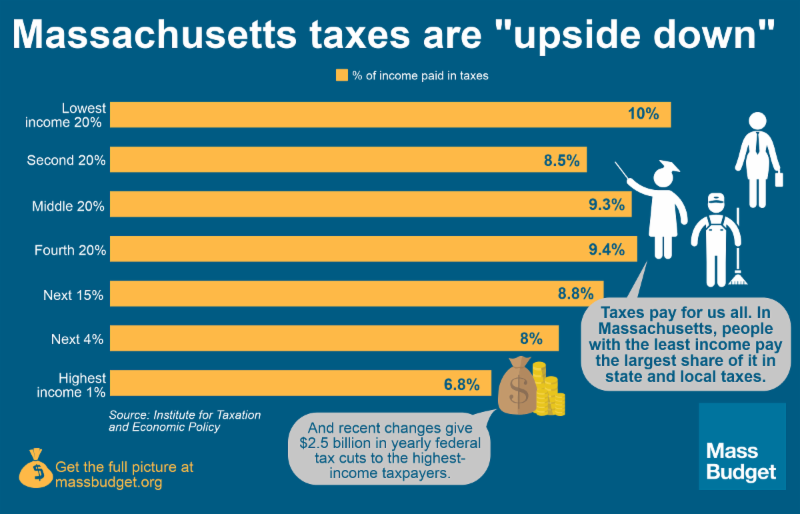 Who pays state and local taxes in Massachusetts? 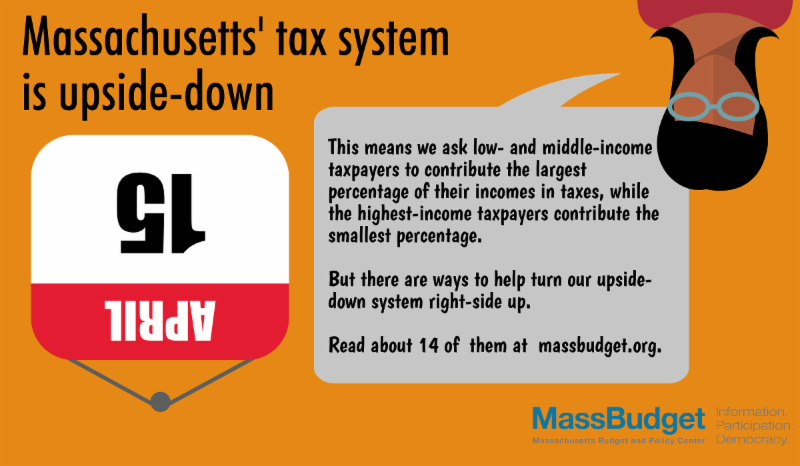 Massachusetts' tax system is upside-down, meaning it asks low- and middle- income taxpayers to contribute a larger percentage of their incomes in taxes than high-income taxpayers. How do decades-old tax cuts affect our state today? The upside-down nature of our taxes were exacerbated by tax cuts from the late 1990s and early 2000s. These tax cuts, which today mean more than $4 billion in lost revenue per year, mostly helped the highest-income taxpayers. What are ways to help turn our tax system right-side up? But there are ways to turn our upside-down tax system right-side up. MassBudget explored 14 options that would not require changes to the State Constitution. 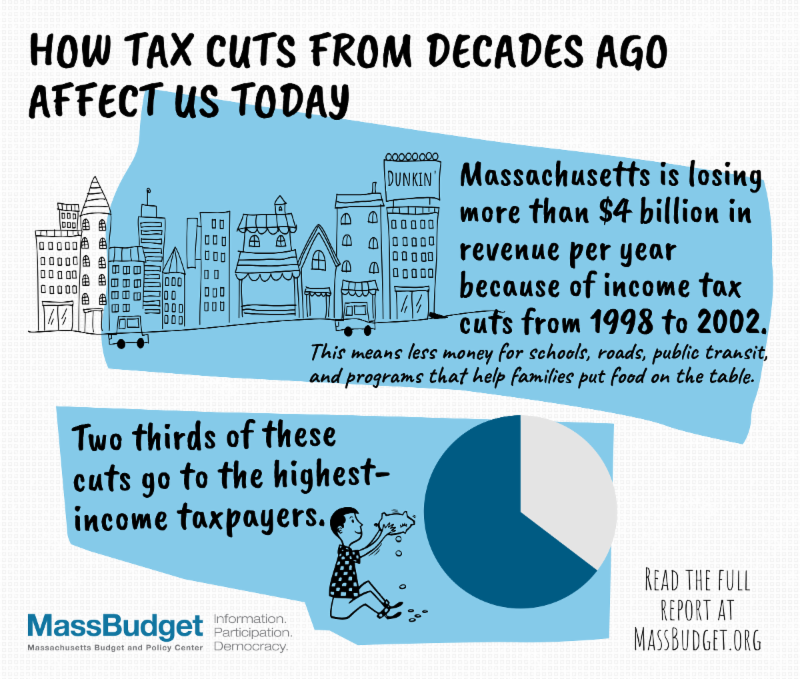 For more information on the state's tax system and other policies that affect the lives of low- and middle-income people in Massachusetts, visit massbudget.org. Or follow us on Twitter or Facebook.